Bridal Fashion Week came and went so quickly, but don't worry, we haven't forgotten to share our style finds and giveaway of Bridal Market goodies! The hands-down favorite trend this year is chiffon fabric. We saw many bridesmaid lines devoted entirely to chiffon, creating free-flowing and light dresses that are a clear move away from the traditional satin gowns. In today's economy, there's little room to buy the "extras", so picking a bridesmaid dress with rewearability can go a long way in easing your bridesmaids' budgets. We know the running joke of actually wearing a bridesmaid dress again, but this Market made a believer out of us and hopefully you'll feel the same way too when we unveil the new styles in a few short months. Another fabric that has been dominating bridal gowns and is now creeping into bridesmaid dresses? Lace! We were surprised too, but some of the designers we spoke to are convinced that it's the next big thing. Would you dress your party in lace bridesmaid dresses? 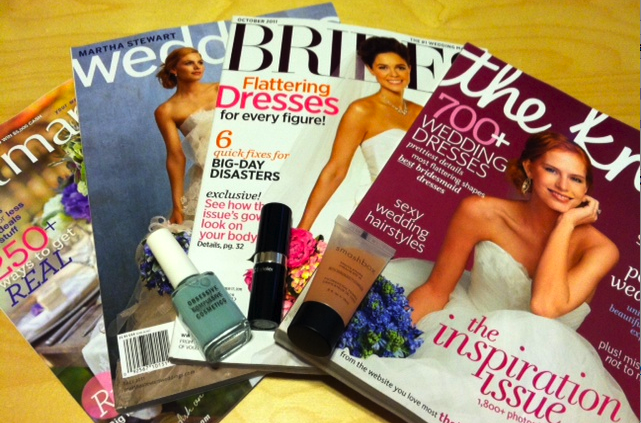 Comment on our blog or facebook page and you'll be entered to win this selection of magazines and cosmetics plus a one year subscription to Martha Stewart Weddings! This contest will run through November 4th (next Friday). Two winners will be chosen through a random number generator. Good luck!